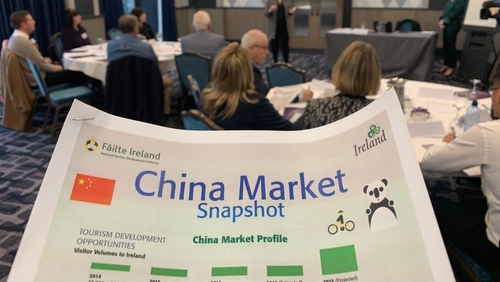 "Irish businesses are very much interested in finding out about the culture," said Wynne Liu, CEO of Emerald Media and trainer at the seminars. "We come across so many challenges, such as language barriers, do we know their culture, do we understand their body language and how can we better provide them with a pleasant experience?" "People are looking for experience," said Ms Liu. "Of course everyone coming here will have a top-ten must see places in Ireland and then they will go sight seeing. They will also take the opportunity to enjoy some authentic Irish cuisines. Food also plays a very important part in the Chinese culture so people like to try different things." "Mid-to-upper class we find that they will travel more frequently throughout Europe. They also will spend some time doing alot more shopping buying souveneirs, Irish made produce as well as presents and gifts and bring them back to present to their friends, colleagues or families." Among those who have attended the training are representatives from Roly's Bistro, the popular restaurant in Ballsbridge in Dublin. "They like to eat family style, they like to have everything together," said Paul Cartwright, Head Chef and director at Roly's. "They bring starters, soups, main courses at the same time and they all tuck in together." "Photo-stops" are also a good idea at visitor attractions as Chinese tourists love to take photos, it says.